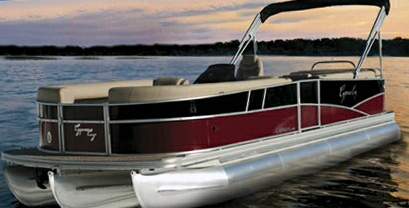 The Boats.com review team finds this 2012 pontoon boat handles like a v-hull. Add the wide open layouts that have always made pontoons a favorite, and you've got a new-found performer that still knows how to party. Don, a pontoon boat customer once was just happy to have a cocktail in hand. 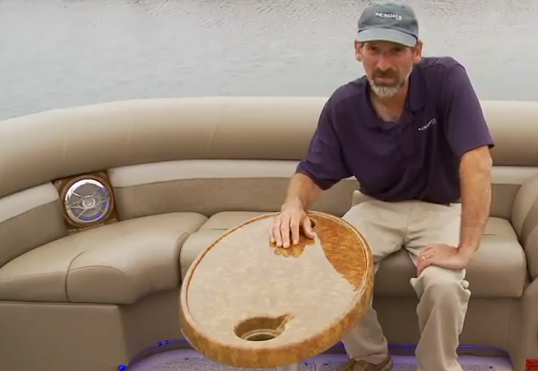 But now they almost demand a fiberglass v-hull's spirit of performance. How do you do that? 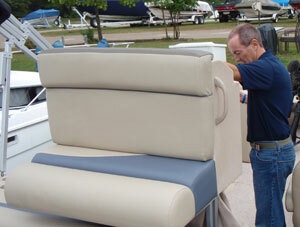 Don Mason, Cypress Cay: For 2012 we introduced an extreme performance system on our pontoon boats. It takes the center tube and lowers it down an additional 3 inches from the outside tubes.We have our traditional lifting strakes like we do on our T3, while with this boat, we actually put a stepped running surface on our center tube. We have a motor pod. It's got more of a v-hull effect, it's got a better running surface, and allows the boat to turn and perform more like a v-hull fiberglass boat. I noticed that yesterday out on the water; we really can carve in and out, it banks just like a traditional runabout. Don Mason: Yes in some cases you can actually turn better and sharper and tighter than most v-hull boats because it doesn't get the slide effect that most of those will give you. 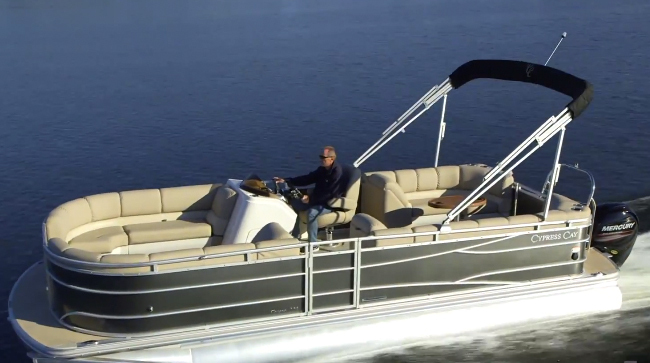 Pontoons may be duking it out with v-hulls in terms of performance, but they've always held the advantage in terms of space. Look around the perimeter of the Cozumel, and you'll find almost non-stop seating throughout the whole boat. There's plenty of storage below each seat, and these rotomolded seat bases, these two part hinges, pivot out of the way and give you full access to the locker below. Out on the water, I really appreciated this raised helm station. It gave me a great view forward, especially when accelerating or maneuvering around the dock. Should the crew require some privacy to put on their suits, a popup changing room extends from below this compartment gives you some privacy. Although you may end up wrestling with the curtain a little, and just watch your balance—the last step's a doozy. Holding it all together below is Cypress Cay's familiar construction. 25 inch pontoons are held to the cross member by solid M brackets, the outsides of which offer full coverage for looks and added rigidity. Rubber tape is used between cross pieces to prevent rattling, and components are fastened with high-tech screws that form a friction-weld between the metals. I'm more and more impressed by the handling of today's higher end pontoons. Quick trim response, combined with the lower center tube, allowed me to drop the Cozumel's bow just as I entered into a corner, and raise it as I exited, to bank aggressively through the turn, just like a v hull with no prop ventilation. 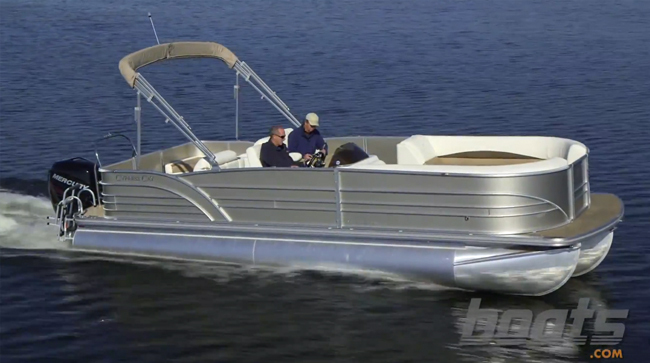 In fact, this is probably one of the best-handling pontoons I've tested to date. 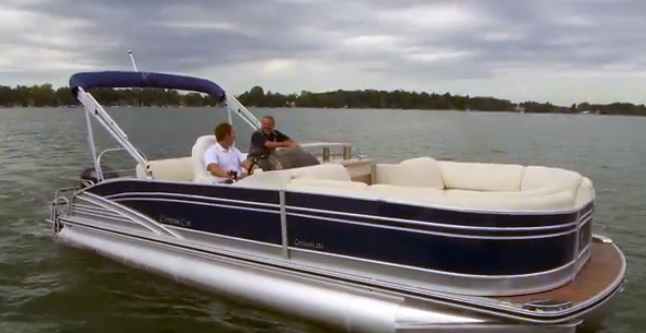 With a Mercury Verado 250, the boat jumped quickly onto a plane with almost no bow rise. Top speed was 43.4 mph, and I noticed a best cruise at 3.3 mpg at 16.8 mph. I'll be honest—I'm more of a v hull kind of guy. 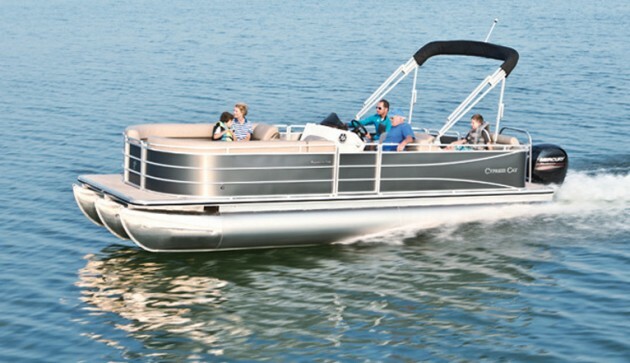 But the performance and hull characteristics of this Cozumel are starting to make me a true believer in pontoons. Try one—you might agree.